This deliciously creepy painting is by the Swiss surrealist painter and sculptor Meret Oppenheim. She painted it in 1939, when she was just 26 years old, Meret titled it Die Waldfrau, which translates as The Forest Woman. As someone who occasionally feels like she might be part tree, I particularly like the ambiguity of this scene. 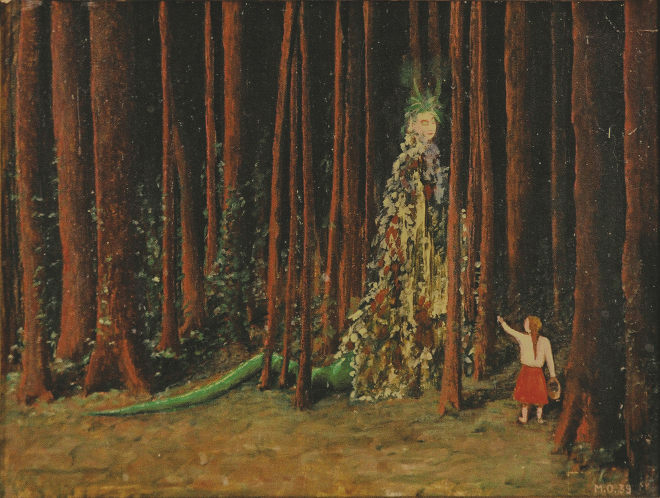 As sinister as the woman, with her long green tail, appears, the child looks utterly unafraid. Find more of Meret’s evocative artwork in the book Meret Oppenheim: Works in Dialogue from Max Ernst to Mona Hatoum. This entry was posted in Writing prompts and tagged creative ideas, inspiration for writers, Meret Oppenheim, story ideas, writing inspiration by Judy. Bookmark the permalink.